« How old is Kim Cattrall anyway? Forestry have recorded a new self-titled long players so they came by the CRC studio for a chit chat and to share some new music. They also play one from one of their favourite Vancouver bands Ladyhawk and reflect on an old Zone Band of the Month called Greatest Explorers in the World. Then we talk about who might have been the greatest explorer in the world? Henry Hudson? SWA? 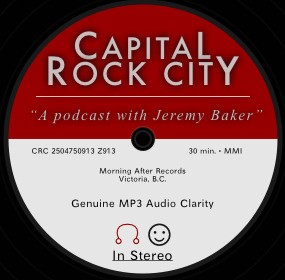 If you are new to the CRC experience and enjoy the program please take the time to find my show on iTunes, just search for ‘Capital Rock City’ and it should pop. Subscribe/comment/rate. It really helps. You can also subscribe using this RSS feed. Thank you. Peter and Blake of Forestry came by the studio on Monday night to share with me their new music. I like these guys because not only do they make sweet sounding indie pop, they are also radio guys! Peter jams out on Village 900am and Blake you’ll hear on CFUV. We talk about things they have to do with trees, wood and wood related professions, some of their fave BC indie rockers, Blake’s sad panda tale about Edmonton, Peter’s love/hate relationship with Victoria, their take on who might have been the world’s greatest explorer and their upcoming shows at Lucky Bar. My wife Coral has been very hard at work rearranging our apartment and in her organizing, she inadvertently dug up an old CD. In Medias Res’ first ever concert. recorded and put to CD and I got it! So next week I’ll pop it in the CD player here at The Zone and press play and we’ll hear what comes out. I always need new music to feature on Capital Rock City so if you’re a Victoria, Island, Vancouver or Hinterland BC band, I’d love to have some music to feature. Heck, I’ll even take a Washington State band if you crush.